No, About self-proclaimed musician "Yôko Higashi"!! I inform everyone about the fact she made and appeal for strong anger. I have known her since the end of 2006. I started Internet since June 2006. 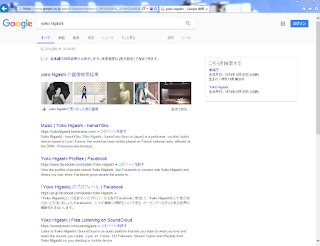 When doing an ego search my real name Yoko Higashi, a lot of names with Circumflex sign called "Yôko Higashi" were found. I do not know how to display the Circumflex sign(or macron) on a personal computer. Therefore, this name is all copy paste. In October 2007, I announced my illustration work, at my real name Yoko Higashi on multiple image submission sites in English area . 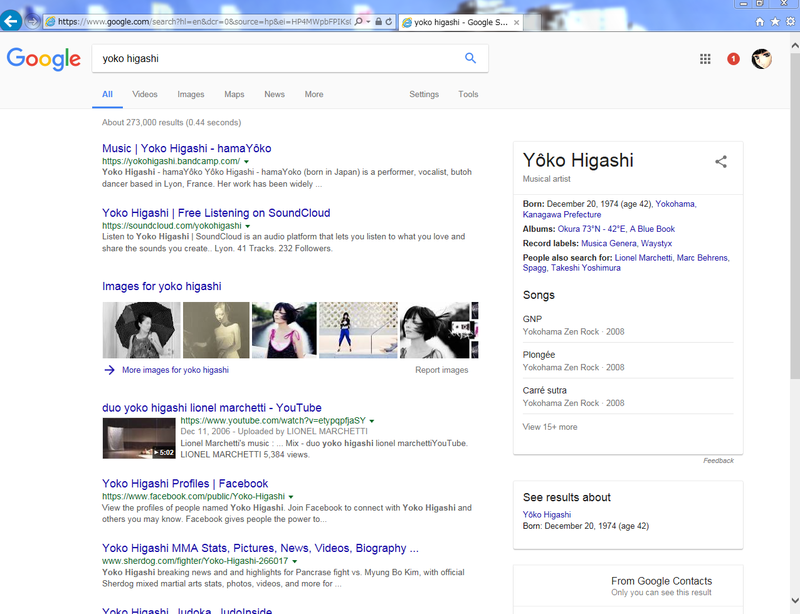 Two weeks after that, "Yoko Higashi" came out as a search candidate. When I looked at the search results, it was almost my English-area image-picture website. About the same time, "Yôko Higashi" who emigrated to France had been announced on the music website to indie debut as "HamaYôko". However, her since January of the following year, changed all the name of the activity to "Yoko Higashi" which is on the search candidate one after another. Even though she have a stage name　”HamaYôko”, her changed it to "Yoko Higashi". And, many her names such as video posting to YouTube, CD work etc were changed to "Yoko Higashi". Inside, there was also a name combination with "HamaYôko". Also, in a certain year, she was named as a small concert where amateur musicians gather, even though it was "HamaYôko" in advertisement, why, when she appeared, she changed the name to "Yoko Higashi" are doing. That fact is left on image posting sites such as Flickr. Her name reflected on the back of the stage was "Yoko Higashi"! Fans who follow her for a long time will know. "Why change names a lot?" ... Various speculations should come out. From the beginning, I have continued to appeal to searchers for mistakes of candidates for subsequent search results. Today, her name is "Yôko Higashi", "Yoko Higashi", and, stage name "HamaYôko", these three names are propagating to activities on the net and the reality activity. Even this alone should not be. In addition, please see the screenshot below. ... Our birthdates are exactly the same! This is both my date of birth!! Why did she leave this condition with after becoming quarrel farewell? I know her true birth date. Born April 29, 1974 in Yokohama, Kanagawa Prefecture. This was posted on a Japanese maniac idol data collection site, I have confirmed to her when I am involved with her. When I sent a message saying "Happy birthday" on April 29, she replied "you remember it well, thank you". 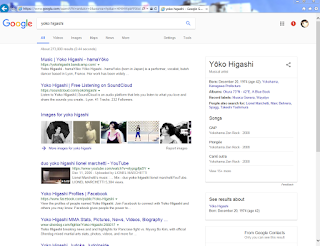 She used my english name "Yoko Higashi", and as a result, both her name and her birthday are stealing from me. There are other some same name on internet, but I have never seen a case of taking action like her. I feel sick all the time for her. Readers, I want you to remember this word well. She stole making stole of my search suggestion candidate name "english name", and, my "date of birth", becoming either "me". I have no other way than to appeal her behavior here. I think so will spend normal in the future. Which is "stupid" is me or her?